"You're a member of the German Secret Service. You know the fate of a traitor to that Service." 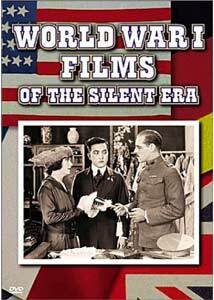 A pair of two-reelers and a full feature from the Blackhawk Films archives make up this interesting set that looks at World War I through the eyes of the young cinema. Fighting the War (1916), 22m:57s, is a collection of shots from the front, in a very early effort at documentary filmmaking. The film depicts scenes of massing troops, and using railroad cars to move gigantic shells, as well as using compressed air to tunnel under the German trenches. While there are a number of interesting views, there really isn't yet a coherent thread to the picture. Most notable is a segment at the end during which the plane the cameraman is riding in engages in an aerial dogfight. From the other side of the trenches comes the German effort, The Log of the U-35 (1917), 26m:25s. This began life as a German documentary that was used as propaganda material. However, a print was captured by the British and it obtained a wide release, serving as effective propaganda for the Allies as well. This is essentially documentary footage of a U-boat and its adventures at sea, sinking ship after ship. As edited, the Germans appear to take a sadistic glee in sending the ships to the bottom as quickly as possible. Numerous striking shots are incorporated; you'll be amazed at the number of different ways a ship can go under. Two versions, one British and one American, are here edited together to recreate the original footage as best as possible. The Secret Game (1917), 01h:07m:14s, is one of the earliest surviving films from the Paramount studios under that name (previously it had been Lasky and Famous Players). Starring Sessue Hayakawa (today best known as the commandant of the camp in Bridge on the River Kwai) as Nara-Nara, a Japanese intelligence officer, this picture tells the story of a ring of German spies that has infiltrated the offices of Major John Northfield (Jack Holt). Among these are his friend Dr. Ebell Smith (Charles Ogle, who starred as the first Frankenstein Monster in 1910) and his love interest, Kitty Little (Florence Vidor). The picture plays like a very modern spy tale, and contains enough twists and turns and complications to satisfy John Le Carré. Considering that the picture fits this material all in barely over an hour's time, the action necessarily moves very briskly. It's really astonishing to see this picture, made only a couple years after those depicted in the set The Movies Begin. Cinematic technique came a very long way, very quickly. It's also quite wild to note Hayakawa being presented in a heroic role, racism of the period notwithstanding. Indeed, the ostensible hero of the piece, the lantern-jawed Holt, is a dunderhead who is surrounded by Hun spies and is completely clueless. Even more daring for the time are suggestions of a romance between Nara-Nara and Kitty. Of course, at the time Japan was an ally of the US, and thus was not treated with the derision that was endemic in the films of World War II. But that's another disc for another day.Having reviewed the earlier set Civil War Films of the Silent Era, I was expecting this disc to consist entirely of fictional films, such as The Secret Game. The combination of documentary and fictional material was quite welcome and makes for a very well-rounded disc. Image Transfer Review: The picture is the original full-frame image. The two short films are in rather marginal shape, no doubt due in part due to the wartime circumstances under which they were shot. U-35, in particular, tends to be rather over-contrasted. The Secret Game is from a beautiful nitrate print with plenty of detail. It is appropriately toned (sepia for most of the duration), with excellent shadow detail through most of the running time. There are a few segments suffering from decomposition, but these are brief and another reminder of the importance of film preservation. Audio Transfer Review: The musical accompaniments are by Eric Beheim, performed by him on the organ. These are mostly culled from the classics, and are not entirely appropriate to the scene. It occasionally becomes jolting to hear a familiar tune from Peer Gynt, or Ring of the Nibelung or a chestnut from Pictures at an Exhibition against documentary footage of combat. However, the audio transfer of the sound is excellent throughout. There is no instrument like an organ to generate really deep bass, and this soundtrack delivers that bass nicely without being overpowering. The various effects and voices from the organ are presented with clarity and without distortion, hiss or noise. Extras Review: Aside from a decent set of production notes that mostly cover the two shorts and skip over The Secret Game, the only extra is a well-done 1975 documentary, The Moving Picture Boys in the Great War (50m:09s). Directed by Larry Ward, this features a wide array of film clips to show the change in public opinion from the plea for peace (and incidentally isolationism) in Griffith's Intolerance to the jeering at 'The Man You Love to Hate,' Erich Von Stroheim. Supported by tons of film clips, almost all of which are in beautiful condition, it makes one long for additional volumes in this series so we can see the full-length films. The narration by Lowell Thomas is occasionally a bit cheesy, but it's serviceable and doesn't get in the way of the clips. Several cinematic relics of The Great War make it to DVD with splendid transfers and a very good documentary to boot. Well worth seeking out for history buffs.